AWCA star Dahria led the Canadian contingent at the World Junior/U23 championships in Soldier Hollow, Utah, locking in three top-20 performances over the week long event to solidify her role as the nation’s top prospect. Beatty, 22, finished 12th in the sprint, 16th in the 10 km skate and 19th in the skiathlon to lead the team. “The top girls at U23 world championships are capable of top top-20 performances on the World Cup,” said AWCA coach Chris Jeffries. Competing at elevation on an extremely hilly course which didn’t play to her strengths, Beatty battled all week with the top young athletes on the circuit. She qualified eighth in her sprint, and was in striking distance of the top-three. A tactical error may have cost her a better result on the day, but Beatty was skiing well, bringing her never say die approach to the heats. A 12th place finish was satisfactory on the day, as Anna Dyvik of Sweden won the race, followed by The Krokan Murud o Norway. Maja Dahlqvist of Sweden finished third. In the 10 km skate, she was right up there with the leaders until the eight kilometre mark, but ‘blew up’ on her last trip up the big climb. “In the 10 km, she was right there after the first lap. She had only given up 15 seconds to the winner. But on that course, she gave back a ton of time on the second half. That’s not like Dahria. 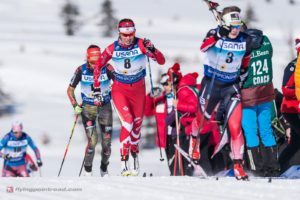 She’s a really good finish and the results are uncharacteristic of her skiing… We learned that course and that altitude doesn’t suit Dahria’s skill set, but she’s still walking away with a positive experience,” Jeffries said. She’ll now reset and focus on world championships, where she will join fellow AWCA teammate Olivia Bouffard-Nesbitt in Lahti, Finland. Maya MacIsaac-Jones also raced the sprint at U23s and finished 31st. It wasn’t the result she was looking for, but she redeemed herself the following week at Eastern Canadian championships with a three medal performance. Jeffries said the races were solid for Beatty, but not spectacular. The results prove a specatacular race wil have her competing for a podium.